WILLIAMSPORT, Pa. - Coming off its third eight-win season in four years, the Lycoming College football team was selected third in the Middle Atlantic Conference Preseason Coaches’ Poll, the conference office in Annville, Pa., announced on Monday, Aug. 17. The Warriors received 62 points in the poll to finish just behind 2014 NCAA Tournament squad Delaware Valley, which had 67. Widener was the unanimous selection to repeat as conference champions after reaching the NCAA Tournament quarterfinals in 2014, earning 81 votes. Albright (58) and Stevenson (56) round out the top half of the poll, while Lebanon Valley (39), King’s (32), Wilkes (29), Misericordia (16) and FDU-Florham (10) make up the rest of the poll. 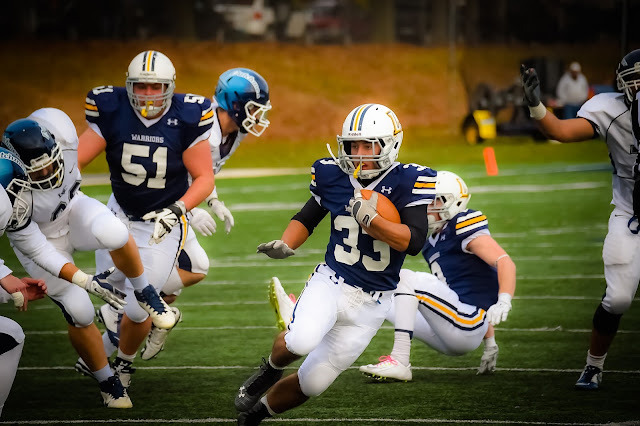 The Warriors, who are receiving votes in the initial D3football.com poll, rose as high as 20th in the national poll and earned votes during five of the first six weeks during the 2014 season. The team finished 8-2 and in third place in the Middle Atlantic Conference, finishing behind only NCAA Tournament teams Widener and Delaware Valley. The team was paced by 13 All-MAC performers, including Capital One Academic All-American running back Craig Needhammer '15 (Lansdale, Pa./North Penn) and senior D3football.com All-East Region wide receiver Ryan Umpleby (Forest Hill, Md./Fallston).